A-HOTEL.com - Luksusowe i tanie hotele w Mljetvine, Bośnia i Hercegowina. Rezerwacja zakwaterowania w Mljetvine i okolicy. Set in Konjic, Holiday Park Tajoraft offers accommodation with free WiFi and access to a garden. There is a fully equipped private bathroom with shower and free toiletries. Obiekt Exo Log Cottage położony jest w spokojnej miejscowości Glavatičevo, zaledwie 50 metrów od prywatnej plaży nad rzeką Neretwa. Domek mieści się w zielnej okolicy o bujnej roślinności. Offering free bikes, B&B Vila Sunce Boracko Lake is located 300 metres from Boračko Lake and 18 km from the centre of Konjic. It provides accommodation with free Wi-Fi and free private parking. Surrounded by greenery, Herzegovina Lodges is set in Boracko Jezero. Free WiFi and free on-site parking are provided. 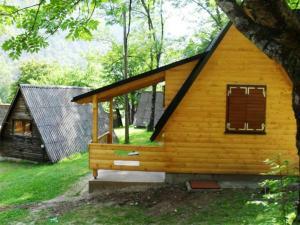 Set in Jezero, Camp Borasnica Bungalows offers accommodation with a terrace and free WiFi. A patio with mountain views is offered in every unit. Set 100 metres from the lake with its beaches, Guest house Boračko Lake offers a restaurant and accommodation with free Wi-Fi. Free private parking is also provided. Located in Jezero, 36 km from Breza, Bungalovi Enco Boračko jezero features water sports facilities and free WiFi. A fridge and kettle are also featured. Cozy house next to river Neretva in nature is located in Dzajici, 7 km from Konjic. With mountain views, this accommodation provides a terrace. Obiekt Džajića Buk Rooms położony jest w miejscowości Džajići, w odległości 6 km od miasta Konjic. Obiekt, usytuowany nad rzeką Neretwą, udostępnia bar, sprzęt do grillowania oraz prywatną plażę z leżakami i parasolami. Mountain house Varda is situated in Ledenice and offers a garden. 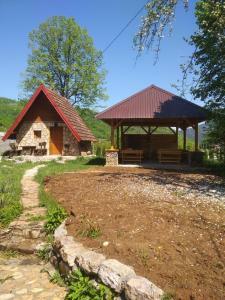 The property features mountain views and is 27 km from Mostar. Cabin Rujište is located in Padežina. Guests have a private terrace. Complete with barbecue facilities and a garden, Hidden Nest Ruiste is situated in Mostar, 24 km from Old Bridge Mostar and 23 km from Muslibegovic House. Guests staying at this holiday home have access to a terrace. Vacation home Rujiste is set in Mostar and offers barbecue facilities. The property is 24 km from Old Bridge Mostar. Hotel Snjezna Kuca położony jest pośród lasów porośniętych sosną bośniacką, drzewem, które produkuje duże ilości tlenu. Obiekt znajduje się w kurorcie Snjezna Kuca-Rujiste i dysponuje własnymi stokami narciarskimi. Offering free WiFi and mountain views, Kameno Vrelo Bungalows is an accommodation situated in Konjic. The holiday home features lake views and is 33 km from Breza. Located in Konjic, Apartmani Lux Novalić features a garden. Featuring a 24-hour front desk, this property also provides guests with a terrace. Located in Gornji Lukomir, Etno-house Lukomir features accommodation with barbecue facilities, free WiFi, a 24-hour front desk, and luggage storage space. This country house offers a bar. Obiekt Farm Ville "Natura AS" Lukomir usytuowany jest w miejscowości Gornji Lukomir, w odległości 32 km od Sarajewa, i oferuje sprzęt do grillowania oraz widoki na góry. Hostel udostępnia także taras, szkółkę narciarską i restaurację. Boasting a garden and a terrace, Etno House Stari mlin features accommodation in Konjic with free WiFi and mountain views. The property has river and garden views. Set in Gornji Lukomir, Guesthouse Letnja Basta has a garden and a terrace. Among the various facilities are a shared lounge and a bar.